Completely Private Location overlooking year-round stunning ocean views and sunsets. The 2000 square foot home has 2 private master bedrooms equipped with air conditioning for your comfort and a fully functional kitchen with an attached great room to enjoy. The house is surrounded by lush tropical forests with attention grabbing Howler monkeys, gorgeous birds and butterfly species for you to enjoy a full nature experience. There are several fruit trees on the property for you to enjoy some fresh fruit when in season. The 10-mile long secluded beach is a 1/4 mile away. Horseback riding, Surfing, Kayaking, Snorkeling and Fishing awaits you. If you tire of the beach, lounge around the infinity edge pool and feel like you never left the proximity of the ocean. Excellent and reasonably priced local restaurants are nearby, offering a variety of local and international cuisines. Canopy adventures are within driving distance in nearby towns. The property is located 45 minutes from the Punta Islita National Airport and a 2 1/2 hour drive from the Liberia International Airport. San Jose International Airport provides flights to and from Punta Islita Airport. Your host in the infinity pool overlooking the sunset enjoying the view and some coktails. We built our house from scratch. It has all the comforts of home with a Costa Rican touch. We visited this area a few years ago; and when I visited his place I fell in love with Costa Rica all over again. I have been vacationing here since 1991 but was a little discouraged with all the building that was going in other areas of Costa Rica. Then I found Playa Coyote, WOW.....Playa Coyote is still undiscovered by the crowds of tourists. Very pristine compared to the areas of Flamingo, Jaco, Quepos, Nosara, Playa Del Coco, Mal Pais, Sante Teresa, Samara and Tamarindo. If you want crowds go to those places I just mentioned, if you want peace and tranquility come to Playa Coyote and the other small villages in this area. The beach here is 10+miles long, and there will be many times when you are the only one on the beach. If you enjoy waking up to the sounds of birds and howler monkeys my place is for you. If you enjoy Great Sunsets and Great Views my place is for you. The name of the game around here is RELAX....RELAX....and more RELAX. If you are looking for crowds and a bar scene find another place, PLAYA COYOTE is a place to ENJOY THE BEACH, UNWIND, EXPLORE, and ENJOY NATURE. My Wife and I spent 6 wonderful relaxing days exploring this area of Costa Rica. George was great to deal with and his property and house was clean and very peaceful with all the sights and sounds of nature at the doorstep. The view of the Pacific is breathtaking. People looking for a more remote location without all the "touristy" stuff this is the spot. The local Ticos are very friendly and the food/dining options are all excellent. Renting a 4X4 SUV is the best way to explore the many back roads up and down the coast. Peter looking forward to having you again as a guest. Thank you, looking forward to your next visit. We enjoyed our stay at playa Coyote. 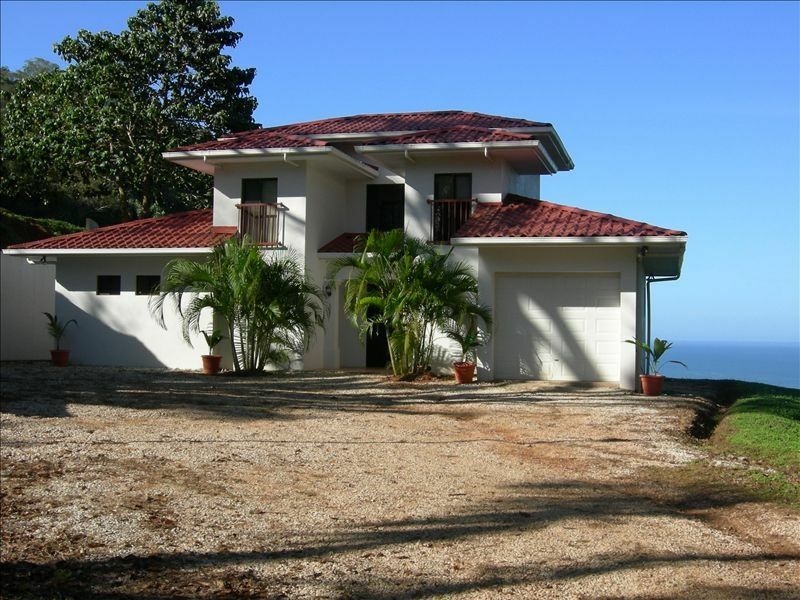 The house was comfortable and the location allowed us amazing views of the ocean and countryside in the area. Nice that there was air conditioning in the bed rooms. Beds were very firm but comfortable. Kitchen is small but functional. The fridge is a perfect size for two, may be small if you had more people and you ate in. A lot. The beaches in the area are beautiful and almost empty of people. A few great local type restaurants close by- George ‘s recommendations were accurate. This home is very rural and we were sad that there was no where to rent boogie boards or surf boards. If I went to this location again, I would bring some with me. Things I would improve in the home is a screen on the front door so at night you could allow air to flow through the main floor and make it more comfortable. We left it open and many bugs and critters joined us for games/movies. The beautiful view and pool made this stay exceptional!!! The road up to the place is steep- we would recommend a 4x4. Heard Howlers daily and got to see them several times- another highlight of our time here. Thank you Heather, it was a pleasure having you. Thank you for the feedback. Hope to hear from you again in the future. This is the perfect place to have unforgetable vacations. We stayed 3 nights and enjoyed every minute at the property. The house is really comfortable and the view is amazing! Geoge is a nice host, always available to solve your requests! There were a small issue with the keys but not a major deal. We arrived in San Jose De Coyote at 1am due to a flight delay. We were not able to use our U.S. cell phone (Verizon) to call the housekeeper as pre-arranged for the house keys. Luckily a guy standing by the road smoking a cigarette helped us out and his buddies cellphone worked. Vivian's husband arrived 10 minutes later and led us to the house 10 minutes west of town. (5 minutes of that drive is up the mountain on the private drive after you leave the road). The road is somewhat steep and bumpy but very manageable in even a passenger car. Honestly, our first impression of the house when we walked in and saw the kitchen was "uh oh". The kitchen is sparse, as is the case with most of the out-of-country; VRBO properties we have rented. The kitchen was equipped with the basic stuff, although the two non-stick skillets were so worn out that cleaning them was a chore. There were no measuring cups, measuring spoons or even a shot glass for mixing drinks. There were no paper towels, no napkins, no basic condiments of any kind, so be prepared to hit the local grocery for all your basic cooking items. The prices are high for everything, probably double what you will spend at home. There is NO GASOLINE available in town. The two closest sources of gas are the town of Jacaral, 33 km to the east (it's on the way from the Liberia Airport, so stop there on your way to the house and top off. The next closest gas is the town of Cobano, about 38 km south, on some pretty basic gravel roads with several river crossings. (no, not on bridges, you drive through the river) so we recommend a 4 wheel drive. We had a Suzuki Grand Vitarra and it did fine. All the roads in the area are gravel. Drive defensively and avoid the many, many sharp rocks laying in the roads to protect your tires. We carried a rental sat phone (from Mobal) as you are out of cell coverage a lot. The house was clean, and we chose the upstairs master suite. The bed was comfy, and the two basin bathroom modern and well appointed. Note, bring your own hair dryer. The view from the patio is just stunning, and you will experience local wildlife, (howler monkeys, Iguanas, peccary's; Tejons (Mexican word for the White Nose Coti) which is a cousin to the racoon. The pool was clean, and warm. We would not recommend Rios Restaurant at all, but highly recommend Rancho Loma Clara restaurant. Also nearby is Barcos, an awesome beach-front restaurant. We recommend this property and would return. Lynn thank you for taking the time to write a review. Just one clarification, there is gas available in San Francisco de Coyote. It is sold at one of the mechanic shops. But you are correct, there is no gas station those are located in the places you mentioned. The home is a lovely property high in the foothills above Playa Coyote. We were a family of 3, plus 3 dogs, who stayed for 2 nights. Pros: Complete privacy, rainforest on the east side and beach views on the west side, infinity pool to cool off in was refreshing, lounge chairs on the patio were comfy, ensuite bathrooms in 2 large bedrooms were a nice convenience, and of course, having air conditioning was nice and necessary, and lastly, there was good WiFi. Con: This was a minor inconvenience. The check-in was not as smooth as we would've liked due to key issues. But, it all got resolved in a swift and friendly manner. Vivian, the caretaker, was lovely to deal with. George's recommendations for restaurants were perfect. Communication with him was good. Note: The previous comments by reviewers concerning WiFi should not be a concern. We had good wifi connectivity throughout the house. Many other activities can be arranged if you requested.